Our 3-hour city walk includes the best of Szczecin, the second biggest harbour town in Poland. Your personal city guide will help you to discover the obvious and the hidden beauty of this place, and the contrasts found in a town built to resemble Paris. Upon request we can also organise transport, either by private limousine or by coach. The tour begins with a stroll along Staromłyńska Street, lined with historical 18th century houses, and you will then head towards the National Museum. From there you will go to see Orła Białego Square with its Baroque Palace Under the Globe. Next you will enjoy the quietness of the Gothic St. James’ Cathedral, and then on through Farna Street where once stood the building in which the Russian Tsarina Catherine II was born. The next stop is Solidarnosci Square, the scene of clashes during the 1970 workers’ demonstrations and also of the St. Peter’s and St. Paul’s Church. You will then move on to see the Chrobrego Terraces, the National Museum and the Marine Academy. 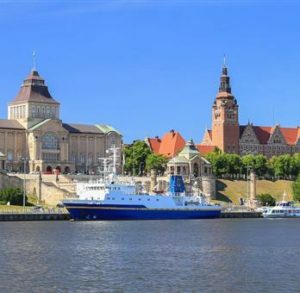 One of the most important sights is the Castle of Pomeranian Princes, reconstructed in the Renaissance style after 1945, and where you will have an opportunity to visit the castle museum. Having experienced the fantastic atmosphere of the castle, you will proceed to the small but very quaint Old Town area. Featuring mighty Dragon & co.